A popular topic that I keep getting asked about is: how to generate more leads from your website. First of all, when it comes to tools, you should definitely be using something like Hello Bar, which is Neil’s simple, non-invasive tool to collect more emails, or Sumo Me, which is good for takeovers or specific pop-ups for specific pages. Both are good for email collection and can help you drive visitors to specific pages of your site. The first thing you need to do is figure out why someone should become a lead. Everyone just says, “Hey, give me your name and information.” But have you thought about giving your visitors something in exchange for becoming a lead? For example, if they’re looking to generate more traffic, why not give them a guide on how they can generate more traffic? In exchange, ask for the name, email, phone number, company, company size, etc. Typically I don’t ask for the company, I just ask for a company email (which is the same thing but saves you one field). The key is to get in the mindset of consumers and figure out why they would want to become a lead. Let’s use the marketing niche as an example. If we want to create lead generation content, we’ll have some blog posts around pay per click, SEO and content marketing. You want to make sure you’re categorizing these, either in the URL itself or on specific pages, in order to more easily segment your audience. Not only should you be targeting people based on the categories they’re visiting, but if you send people to very specific content upgrades or exit popups based on the content they’re reading, you’re going to increase your conversion rates even more. I’ll give an example. Let’s say our conversion rate is normally just 3-4%. 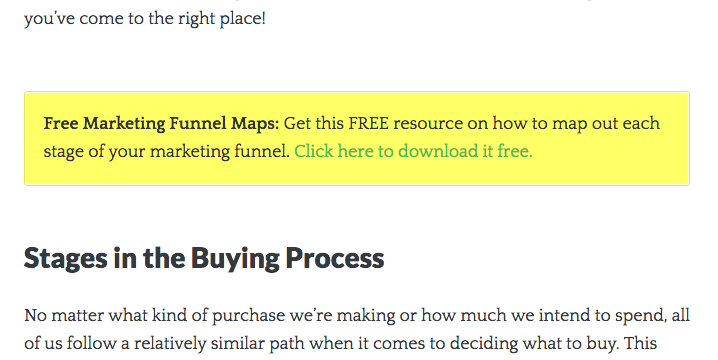 For a post in which we talk about marketing funnels, our conversion rate is 15% because we’re sending a very specific segment of visitors to that page. People like things that are more relevant. Instead of trying to give them a general lead magnet, give them a specific e-book or video unique to their needs. Think about how you could stand out from the crowd, especially if you’re in the marketing niche. It’s an echo chamber and a lot of people are talking about the same things over and over again. You have to think about what you can do to separate yourself from the pack. Think about sending people to case studies first. At one point I was generating 4,000 to 5,000 consulting leads per month. That’s a lot of consulting leads. But what we ended up finding out was that over 90% of these leads weren’t qualified. So we decided to start sending people to case studies and testimonials before anything else. The results spoke for themselves. By showing our leads what type of target client worked best with us (size, industry, need) our lead count fell through the roof, but we were getting way more qualified leads. In fact, our qualified lead ratio went up 300%. You can do this for consumer-based topics, too. If you’re selling something that’s related to weight loss or skin rejuvenation, for example, you could be sending people to topical articles that explain how to do it right and how your eating habits affect your skin and your weight. You can even mention other people who enjoyed results using the practices you’re talking about. Then you can have them download an e-book or other PDF and ask them to become a lead. The idea is that although you’re taking people down a really long funnel to become leads, when they do become a lead, they’re going to be much more qualified. 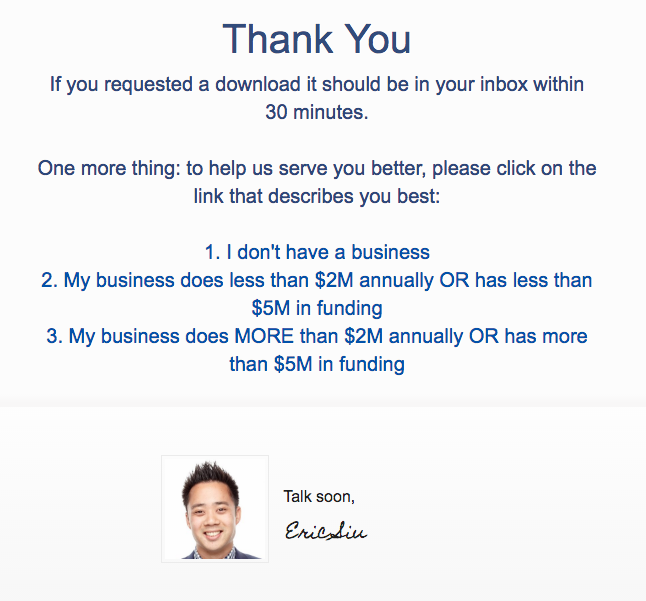 Speaking of qualified, you want to make sure that after people opt in for a lead magnet, you ask them to immediately take another specific action on the thank you page. Whether that’s to watch a webinar or sign up for a free consultation, they’ll be much more likely to take an action once you’ve already convinced them to take a smaller action. When visitors land on the Single Grain thank you page, we ask them “Hey, do you have a business? Is your business above $5 million per year, or under $5 million per year?” We’re basically segmenting our email list as soon as possible. Once people click into a segment, we’re able to tag them inside of our email service provider, Drip (although you can also use Infusionsoft). Make sure you’re segmenting these people and tailoring your message when you’re talking to them. You want to be able to tag people based on the e-books they’ve downloaded, the blog posts they’ve read, the thank-you pages they’ve seen, etc. Once these people are qualified, they’re also getting lead scores. We want to reach out to anybody with a lead score above 80, for example. If they match our ideal buyer or client profile, we’ll obviously want to reach out and see if we can help them with anything, whether that’s pointing them in the right direction, making an introduction to somebody else, recommending that they use a specific software, or even working with them in the future. Another thing I’ve discovered is that you should never have all your lead forms on a single page. You want to break your lead forms down into multiple steps. So instead of just asking for someone’s name, email, URL, phone number, budget, etc. all at once, ask for each of them separately. For example, if your lead form only has a name and email, it looks much more inviting. But after someone provides their name and email and hits enter, another field will pop up asking for their URL. I’ve found that doing this results in a 10-20% percent increase in leads collected. The idea is that when someone already gives you their name and email, they’re more likely to give you the rest of their information, too. This type of form is a lot easier for a visitor to fill out than when you ask them for everything at once. You could use drop-down boxes, too. I’ve A/B tested this type of lead form and it also generated way more leads than the standard lead form. This isn’t surprising—this is way more fun from a user experience point of view. If you’re going to do this type of lead form, make sure you highlight the blank spots so that your visitors know exactly what to fill out. Finally, test all your call-to-action buttons. Don’t just use the word “Submit.” I’ve found that you can get at least a 10% lift in lead generation just by using a CTA button that is very relevant to the problem you’re solving. If you go to Single Grain and hit the free consultation button, we don’t require you to fill out every single form, but we’re not going to tell you that. A lot of lead forms include a star to indicate which fields are required. You don’t need to do that. Don’t tell people which ones are required and which ones are not. Just let them fill out what they want to fill out and go from there. Just this small tweak increased our conversion rates by 15%.